Bring back the shine to your high-gloss floors—without having to worry about harming them in the process. Formulated to loosen and remove soil found in high-traffic areas, while protecting high-gloss, high solids finishes. Plus, it's phosphate-free and leaves no dulling film—without the need for rinsing. 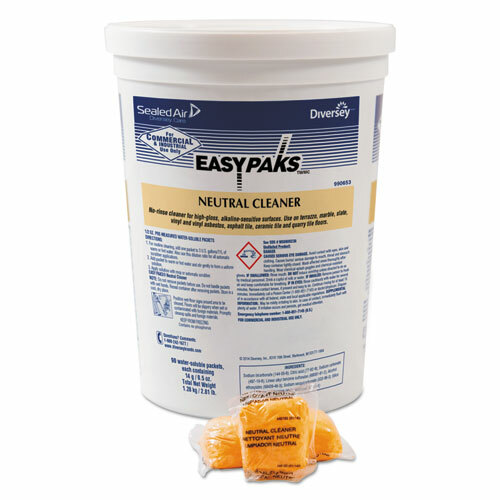 The premeasured packs of cleaning solution quickly dissolve in water, allowing you to start cleaning immediately. Ideal for cleaning surfaces ranging from terrazzo, marble, slate, vinyl and vinyl asbestos, asphalt, ceramic and quarry tile. Cleaner leaves a fresh pine forest scent. Packets come in a large, easy-to-store tub. 90 packets per tub.